Brothers Divided contains a dozen scenarios from the early part of the Gettysburg Campaign. Designed for company or skirmish-level gaming rules such as Brother Against Brother, this book is currently out of print but will be reissued later in 2014 by the publisher, Marek/Janci Design of Wheaton, Illinois. The Enduring Valor: Gettysburg in Miniature series remains my most popular wargaming scenario book for obvious reasons – the innovative and fresh full color graphics layout by Ivor Janci, the first detailed breakdown of the Battle of Gettysburg into regimental-level individual scenarios for Johnny Reb III, and the incredible array of dazzling photographs by various gamemasters of their troops in action. Volume 1 covers the beginning parts of the fighting, with a focus on Day 1 and the actions at the extreme southern part of Day 2. Enduring Valor: Gettysburg in Miniature, Volume 2 covers the fighting at the northern end of second day of the Battle of Gettysburg, including the Confederate attacks on Culp’s Hill (pictured), the Louisiana Tigers’ assault on Cemetery Hill, and the attack on Cemetery Ridge. it also features Pickett’s Charge, which can be an entertaining wargame (especially for whoever commands the Yankee artillery!!!). 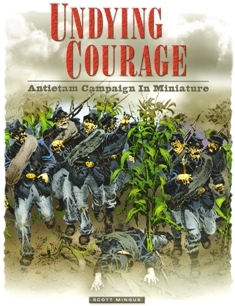 Undying Courage: Antietam Campaign in Miniature is a collection of Johnny Reb 3 scenarios for the battles of South Mountain and Antietam during the September 1862 Maryland Campaign. Scenarios also include one for the battle that closed the campaign, Shepherdstown. Refight the dawn attack on the Cornfield, the desperate assault on the Sunken Road (“Bloody Lane”), Irwin’s attack on the Dunker Church, Burnside’s Bridge, and the rest of the battle. The publisher is planning to reissue these gorgeous full color scenario books! Click HERE to view all of my non-wargaming books that are for sale on amazon.com! 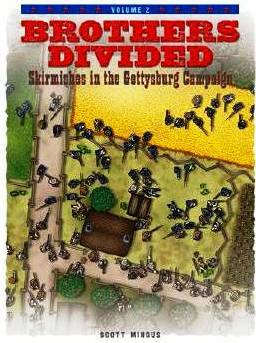 Brothers Divided is my latest wargaming scenario book, with a dozen scenarios from the early part of the Gettysburg Campaign. Designed for company or skirmish-level gaming rules such as Brother Against Brother, this new book can be purchased from many leading wargaming retailers and distributors, or directly from the publisher, Marek/Janci Design of Wheaton, Illinois. Watch for Volume 2 late in 2009 or early 2010! Scott, I purchased your “Brothers Divided” scenario book at Historicon 2009 and really like the layout. My only comments are that the OB’s for the scenarios are a bit large for Brother Against Brother games and are heavy with cavalry. BAB is basically an infantry rules set with cav & artillery as an “extra” bonus. Having been playing BAB for sometime, I find that in the 25-28mm scale, any more than 10 squads of any mix on the table becomes cumbersome. Again, I’m sure the scenarios can be downsized and maybe infantry substituted in place of the cav. Anyway, good start and I hope your second book is more infantry orientated as BAB is intended. I’ll be at “Huzzah” in Portland and look forward to meeting you and maybe get my book signed. Thanks for your contributions to the wargaming hobby. where I can buying two volumes about Brothers Divided? Who distributes these books. I am a game dealer and would like to carry them but I have not been able to find a distributor who carries them. Contact the publisher, Ivor Janci, about wholesale orders. Hello. Are you still selling any of the Brother’s Divided scenario books? I too would like to buy a copy of the Brothers Divided book. Where can I find one? I will send your e-mail to the publisher in case of a reprint. Wonderful. In the mean time do know of any other resources online or else where? There is a Brothers Against Brother Yahoo Group which is quite active. Oh, cool. Thanks again! I am still looking forward to buying your brothers divided book.